3D Printed Jacket #WearableWednesday « Adafruit Industries – Makers, hackers, artists, designers and engineers! 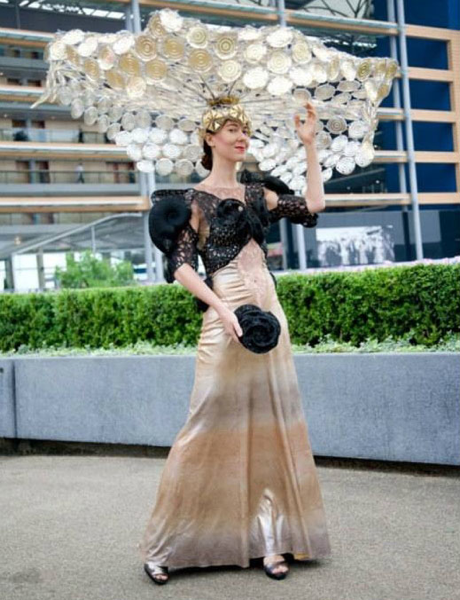 Larisa Katz, the designer and purveyor of couture art, wanted something ‘a bit different’ for Royal Ascot Ladies’ Day, which took place last month. As you can see from the image of her in her outfit below — she achieved her goal in and with spectacular fashion! The hat, dress and jacket were all designed by Larisa, in collaboration with designer Patrick Römgens from Phuntec. But it is the jacket that is the primary focus of this post, because, believe it or not, it was 3D printed. The jacket, as you might expect is completely bespoke and customized to fit Larisa precisely courtesy of a full 3D body scan of the designer herself. From the scan data it was possible to create the right shape in terms of fit and function and from there create the intricate designs (the form) within the 3D model using Blender and Sketchup software.